Add fabric to your entry in some way be it felt, burlap, ribbon or cloth and if you're really feeling brave maybe include a touch of real or faux stitching! 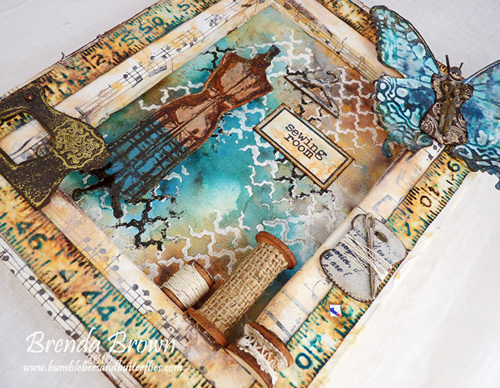 We are looking forward to seeing what ideas you have to incorporate this Sew Special theme in your vintage, shabby, mixed-media, art journalling, industrial or steampunk projects. This month we are proud to be sponsored by the wonderful people over at Calico Craft Parts who have generously offered a prize bundle for our random winner. As ever there will be a lucky random winner (who wins our sponsor's fabulous prize) and three Pinworthies, selected by the Creative Guides and invited to rejoin us as Guest Creative Guides for a future challenge. 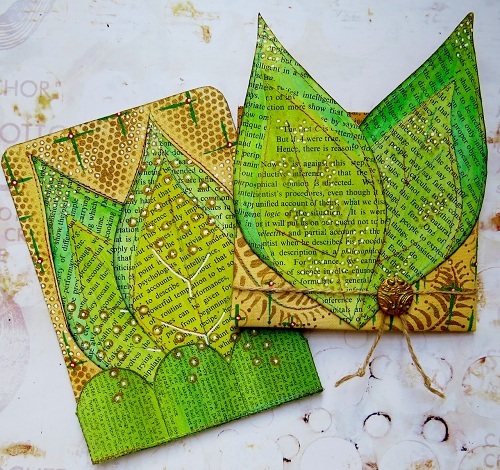 This challenge finally gave me chance to play with my Eileen Hull Sizzix Stitchlits Thin Dies. If like me you hate having to punch separate holes to stitch through in order to add sewing detail to your projects these are the best! 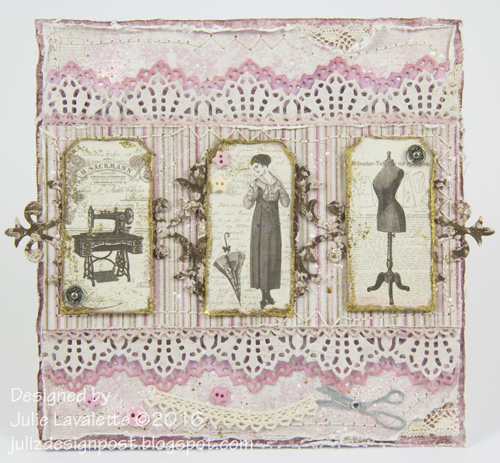 I grabbed some Tim Holtz Eclectic Elements fabric and set to it. You can find out more HERE including a step by step for the background. I had lots of fun making this small Vintage Pillow for Jenny's fabulous challenge using some old linen which takes texture paste and inks beautifully. Hop on over to my blog if you would like to see more! 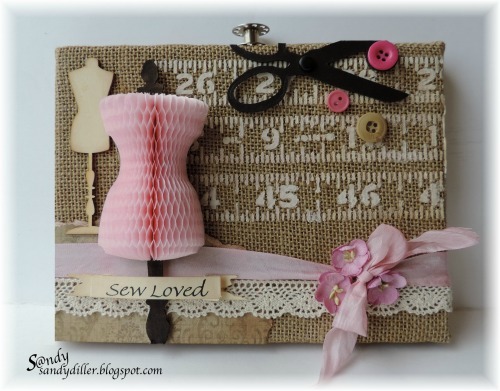 I created a little Needle Book for my Sew Special project using Eileen Hull's Passport Die. I have ribbon, lace and felt on my creation - and I even did a hand stitch on the button! 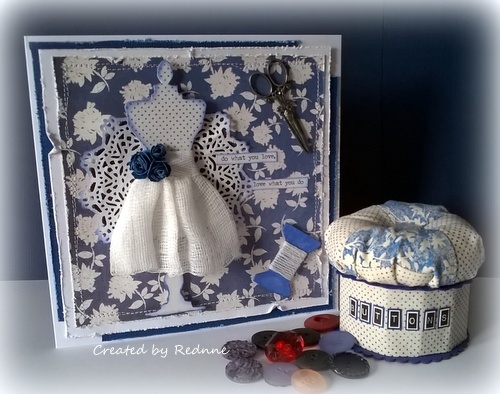 Please stop by my blog for more photos, details and a view of the inside of my Needle Book. 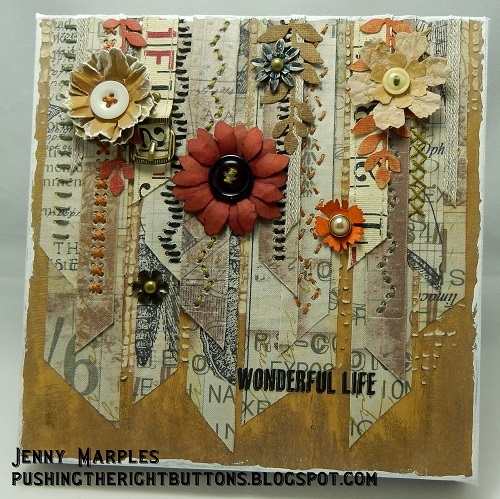 When I read Jenny's challenge theme I was filled with trepidation, sewing and me just don't go together, but when reading the detail it all became fun. I decided to take a very vintage shabby chic route with this project. If you want to see more, just come over to my blog for a full description. My thoughts immediately went to Tim's dress form die when I saw Jenny's theme. I was also inspired by one of Richele Christensen's quilting projects and made a pin cushion 'button' box using fabric I hand stamped and one of Eileen Hull's dies. You can see more over on my blog. What a great challenge from our lovely hostess, Jenny. I used a burlap panel this time along with some pretty pink embellishments to go with the theme - Sew Special. I have a tutorial for you on my blog, My "Crafty" Life on the Internet. Jenny's wonderful theme was the perfect opportunity for me to make a gift for a special blogging friend who just happens to be a wonderful seamstress! 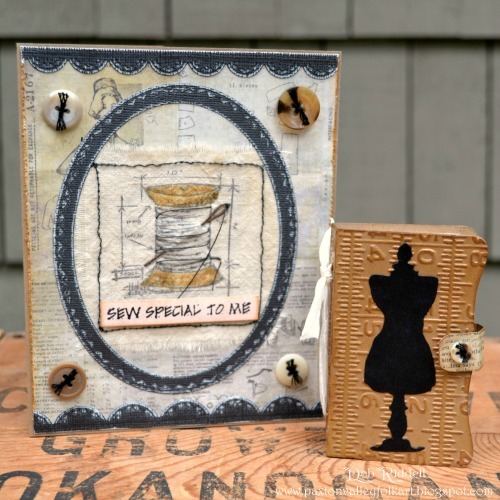 I made a card for her using a needle and thread blueprint stamp by Tim Holtz and then made her a little needle book with a die by Eileen Hull. If you'd like a closer look, I have some step by step photos on my blog, hope you can stop on by! I was so pleased to be able to join in with Jenny's challenge this month. I love sewing themed projects and always feel you can go to town adding many textures and embellishments. I would love for you to stop by my blog HERE to see the info and close up photographs. 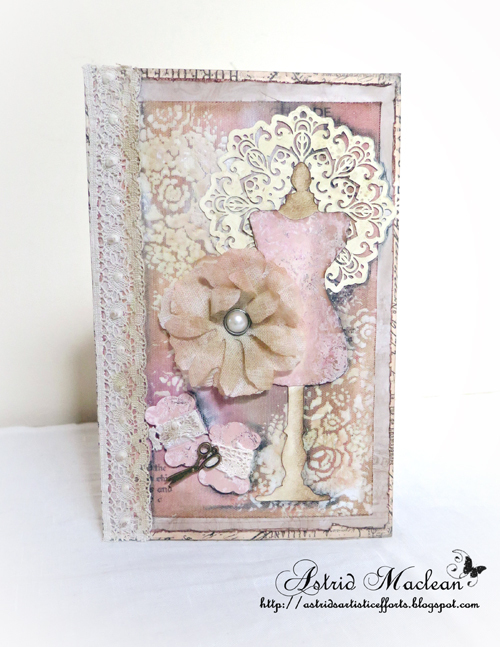 I delved back into my stamp archive to find this gorgeous dress form which has been triple embossed and stamped and I altered lots of 'sew special' elements to create the focus for the theme. I love using the reverse side of a canvas to create depth and I added a dress form butterfly. 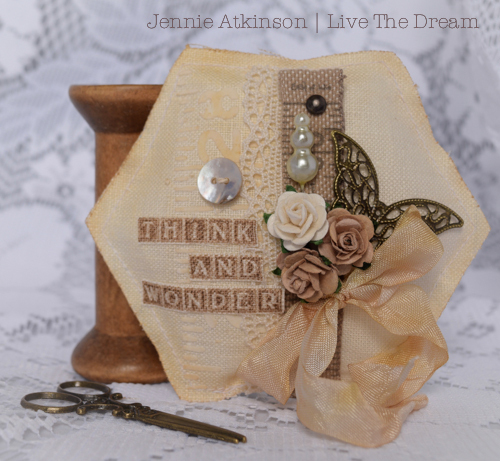 Take a trip over to Bumblebees and Butterflies to see how I made the ruler tape border. I've made a gift card holder and wallet using untreated canvas fabric, paint, vintage book paper, stamping and machine stitching. For more details please click here to visit my blog. You can see with these amazing pieces from the Creative Guides just how many ways fabric and stitching can be included in your projects. Now we look forward to seeing your sewing creations. This challenge is open until Thursday 2nd June. Fabulous projects full of 'Sew Special' inspiration, ladies. Its going to be a joy visiting you all to see more. Another great challenge- looking forward to seeing all the entries . What a beautiful line up of sewing related projects! I can't wait to see each one up close! Great theme, Jenny! Hugs! Wonderful inspiration from the team. Brilliant projects for a great theme - I've had a lovely time hopping round to see the details. Fabulous inspiration for a loved theme. Thanks, ladies! Simply gorgeous inspirational pieces from the DT, thanks for the great challenge! What a fun challenge! Great DT projects. I am going to try and play in this one!